The success of HUGO BOSS is based on the systematic use of opportunities within the framework of the Group’s corporate strategy. The Group is exposed to a variety of risks. The Company’s risk management system includes all measures in a systematic and transparent approach towards risk. It aims to identify risks at the first possible opportunity, evaluate them adequately, handle or avoid them using suitable measures, monitor them and document them. Risks are defined here as possible future developments or events which may lead to negative deviations from the planned operating result. All types of risk are summarized into these five categories: external, strategic, financial, operational and organizational risk. The Managing Board of HUGO BOSS AG has overall responsibility for an effective risk management system. The central risk management’s job is to coordinate the implementation and ongoing development of the risk management system. It is responsible for the centrally managed risk management process and is in close contact with the respective divisions and Group companies. There, the relevant defined risk experts and those responsible for risks (“risk owners”) are responsible for identifying and evaluating risk, adequately dealing with risk and implementing effective risk mitigation measures. Monitoring the effectiveness of the risk management system is the task of the Supervisory Board of HUGO BOSS AG. This responsibility is exercised by the Audit Committee of the Supervisory Board, also with the involvement of the Group auditor. The risk management system is also reviewed regularly by the internal audit department to ensure its proper functioning and appropriateness. Group-wide standards for systematically handling risks form the basis of an efficient risk management system. These are set by the Managing Board and documented in a risk manual that is applicable across the whole of the Group. This is available for all employees to read online. All employees of the HUGO BOSS Group are obliged to be aware of risks in their behavior, especially regarding those risks that may threaten the existence of the Group. The use of modern risk management software makes it possible to record and evaluate all identified risks as well as the associated measures in a uniform way across the entire Group. The risk management system of HUGO BOSS is designed in accordance with the recommendations of international standard ISO 31000. The risk management process used at HUGO BOSS is made up of the four steps of risk identification, risk evaluation, risk handling and risk monitoring and reporting. To ensure that risks are identified at the earliest possible stage, the Group continuously monitors the overall economic environment, the competitive environment in the premium and luxury goods industry, and all internal processes. The central risk management supports the risk owners across the Group with the regular identification and efficient categorization of risks using a risk catalog as well as the risk manual that is available across the Group. Risk owners delegate the regular assessment of identified risks to the risk experts and give their assessment after a thorough examination. Risk experts are supported in their job by the central risk management. Individual risks are evaluated by assessing their likelihood of occurrence on the one hand and systematically analyzing their possible impact on the operating result (EBIT) on the other. Interest rate risks and tax risks however are evaluated based on their varying impact on cash flow. The likelihood of occurrence for individual risks is assessed using a percentage range and is categorized into one of four categories: unlikely, possible, likely and very likely. The extent of any financial impact is evaluated for classifying net risks using four loss amounts of low, moderate, significant and high. The two valuation criteria of likelihood of occurrence and loss amount together form the criteria which make up the risk matrix. This creates transparency regarding the current risk situation in the Company and so supports Management in prioritizing risk. Any net risk as an actual risk potential is defined as the gross risk reduced by the impact of measures taken to mitigate the risk identified. Preparing and implementing suitable risk mitigation measures is the job of the risk owners. Dealing with risks is handled overall in four ways: risk avoidance, risk reduction, risk transfer to third parties and risk acceptance. An integral part of the risk management is therefore also the transfer of risk to the insurer, whereby the financial consequences of insurable risks are largely neutralized. The costs of the measures in question in relation to their effectiveness are also taken into consideration when deciding how to implement the respective risk management strategy. By working closely together with the risk owners, the central risk management monitors the progress and effectiveness of risk mitigation measures which are in the planning stages as well as those which have already been implemented. As part of the regular risk reporting, the risk owners report the risks they have identified, including the respective likelihoods of occurrence, the potential financial impact as well as the risk mitigation measures to the central risk management. They aggregate the information reported and regularly present a consolidated report to the Managing Board and to the Audit Committee. 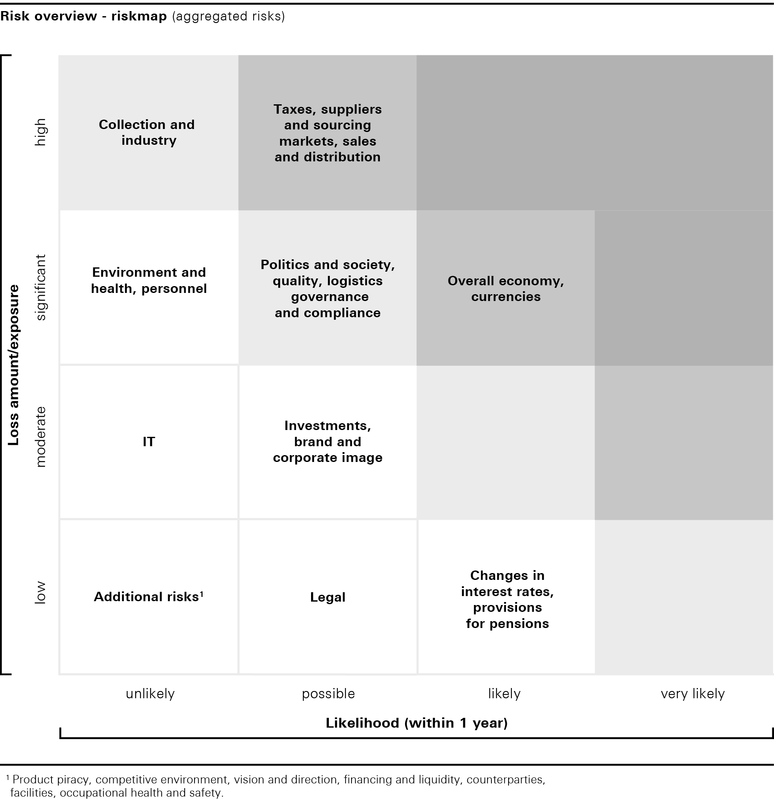 Significant individual risks and aggregated risk categories are given particular emphasis here. When critical or urgent issues arise, the regular reporting process is supplemented by an ad-hoc report. The individual risks are aggregated using two methods to obtain the most accurate possible picture of the HUGO BOSS Group’s total risk position. On the one hand, the expected loss values of all assessed risks within the five risk categories are added together. On the other hand, the probability distributions of all identified risks are aggregated to form a single probability distribution for a possible total loss by means of a Monte Carlo simulation and so determine maximum annual loss values. The result of this simulation in fiscal year 2018 shows that the Group’s equity is in excess of all simulated risk-dependent loss values, even within the tightest confidence intervals. The risk management system implemented forms the basis of the assessment of the risk situation by the Managing Board and is regularly monitored by it. Material risks faced by the Company are regularly discussed and evaluated by the Managing Board. While the assessment of individual risks in fiscal year 2018 has changed, mainly due to developments in external circumstances and the adaptation and further development of the risk management system, the Managing Board could not identify any individual or aggregate risks that may jeopardize the viability of the Company as a going concern at the time this report was prepared. The following sections explain the risks considered to be material in terms of the HUGO BOSS Group achieving its targets in fiscal year 2019. This refers to those risks that have been evaluated in the risk management process as having a higher than “low” potential impact. In general, it is possible that further latent risks or risks that are currently estimated as immaterial may negatively impact the Group’s development in the future to more than the stated extent. Irrespective of the measures introduced to manage the identified risks, entrepreneurial activity is always exposed to residual risks that cannot be entirely avoided even by an efficient risk management system such as that implemented in the HUGO BOSS Group. Material risks are shown in bold. The risks assessed as only having a low potential impact are not explained in more detail. This includes risks in connection with product piracy, risks from the competitive environment, the Company’s vision and direction, financing and liquidity risks, interest rate risks, counterparty risks and pension risks. This also includes organizational risks from the operation of own facilities as well as in connection with occupational health and safety, as well as legal risks for which sufficient provisions were recognized for current litigation and legal consultation costs.